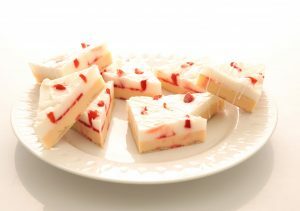 Our Cranberry Bliss Bar Soap is a delightful twist on the popular treat. This is an advanced tutorial, however, it is completely worth the time. The amount you will be making depends on your needs. Using a hot plate and heat safe containers is recommended for this tutorial. You will also need a long rectangular mold, a small circular cavity mold, and a spray bottle of alcohol. And you need a small container to mix the fragrance and stabilizer. Melt the clear soap, then add the fragrance. Then add a 3 to 1 ratio of cherry to caramel soap colorant. It will give the “cranberries”a realistic look. Then pour the soap into the small round molds, filling them only a quarter of the way. 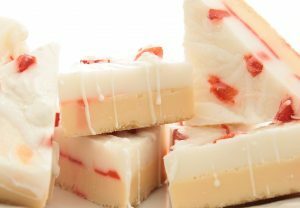 Melt enough white soap to make a 1/2 inch layer. While the soap is melting, sprinkle a generous amount of Turbinado Sugar on the bottom of the rectangular mold, then mist with alcohol. Once the soap is melted, add color until it is light brown. Mix the vanilla stabilizer and fragrance in a small container, and add the mixture to the soap. Carefully pour the soap over the sugar, then spray with the alcohol and let cool. Melt more white soap, ensuring it is enough for another 1/2 inch layer. After adding fragrance and vanilla stabilizer, add very little caramel colorant. Add just enough to make the soap off-white. Then pour into the mold, spray with alcohol, and let it cool. While the second layer of soap is cooling, remove the red soap half spheres from the mold. Then, cut the soap into little cranberry like bits. When the soap is cooled yet still soft, press in the “cranberries” randomly throughout the soap. Spray the top with alcohol and in a small container, melt about 2 ounces of white soap. Then, drizzle the top of the loaf with the melted plain white soap. Finally, quickly sprinkle the top with glitter. Feel free to add your own personal touch. 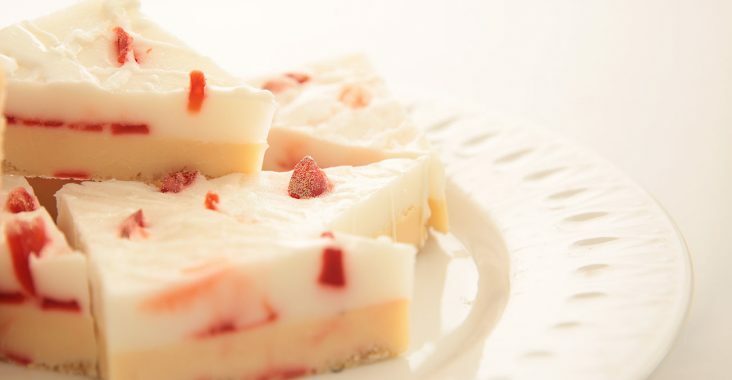 This method can also be used to make other holiday treat inspired soap.